Call Now: 316-776-0040 | 110 N. Rose Hill Rd. Veterinarians employ state-of-the-art technology that is very similar to technology used in the treatment of humans. 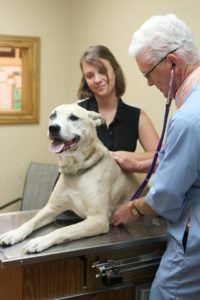 Veterinarians in private clinical practice work to prevent disease and other health problems in their patients. They examine animal patients, vaccinate them against diseases, prevent the transmission of animal disease to people and advise owners on ways to keep pets and livestock well nourished and healthy.